Because of the 8th anniversary of Pekelnej Bar, where Soydan is the main headliner, I wanted to bring to Czech fans little bit more info about very high-profile house gangster. Information in this interview is beneficial to every house head. You can be sure Soydan's style is keepin it traditional with modern touch. Chicago jackin club style, his former professional break dance carrer, tatooing and gangster street background are making his music unique. - Hi Soydan, it is really pleasure to have you here in Pekelnej Bar. It is the 8th anniversary of this place, have you heard some rumours about Pekelnej bar or Prague? Have you ever been to Prague? Hi to all...i heard about a lot but never played in Prague been there few times alright but never for any gig or party..
- I know you are from Ireland, but you have stron background from Turkey. How this different cultures influence you to start djing or doing music? - You have been living in Ireland most of your life? - How long are you doing music? What was the impulses for starting djing and producing? - What was the biggest influences? - What is story behind your name? 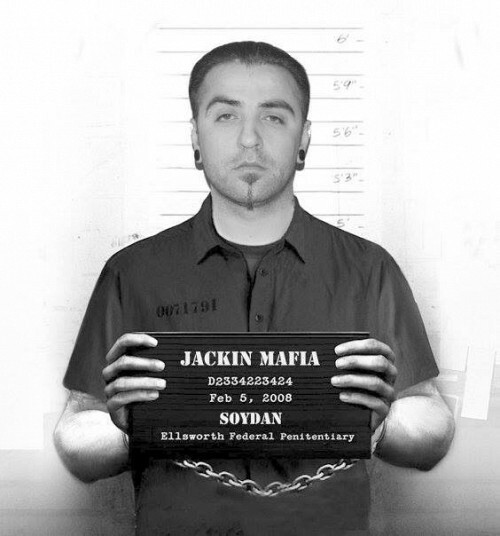 You call yourself Soydan Yakuza, can you tell us more about the origin of those nicknames? Ok. YAKUZA name is originally belong to Japanese outlaws but my story is different first of all i m not japanese gangster or mafia only my nick name is Yakuza..Because i got almost full body japanese Yakuza Tattoos and i love the japanese art, also i do marshall art since age 8. My friends called me Yakuza for a reason and the reason is one day i had issues with organise crime members in Istanbul and some ugly things happen in that time, so i was in the seen with samurai sword chasing them on the street so since then everyone called me YAKUZA and i love it. TrueArtist Soydan, from Waterford in Ireland inked this Trash Polka/portrait back tat. My JACKIN.cz comment - probably best I ever seen! Like for real?! - You are world awarded tatoo artist, when and why did you start tatooing? My tattoo story is start around age 17 in my home town i meet this Italian sailor guy who had brilliant tattoos on he's neck and i was fascinated by it, and right after that i try to get a ink by local tattoo shop but they where so bad i didn't wanna to get ink by them..
After that i went to Istanbul but it was same thing all the scratchers was doing this very poor quality tattoos that i don,t want to get in my skin so i change my mind. - You have been tatooing also some house djs and producers like Dj Sneak, Soul de Marin, DJ Mes, Hector Moralez and many more. Surely you had to travel to a lot of different places, which faces and locations gets to you and you visit them frequently? - I know you have this label Yakuza Records, what its purpose? I guess that you just release tracks your friends send you and you like them, right? Im sure you have some upcoming releases, what we can look forward? - For fans in Czech republic which may not know you, what we can expect from you in your 2 hours set at Peklo? - Sounds great. Thank you for time and for all the Czech crew from Peklo we are really looking forward to have you. Questions was asked by PIF, answers provided by Soydan during some after tatoo chats in August 2013 :) Czech article is also on czech site techno.cz and here on jackin.cz.